it looks like Samsung is currently working on a Dual Wireless Charging Pad something very similar to Apple’s AirPower that was introduced at the iPhone X event. 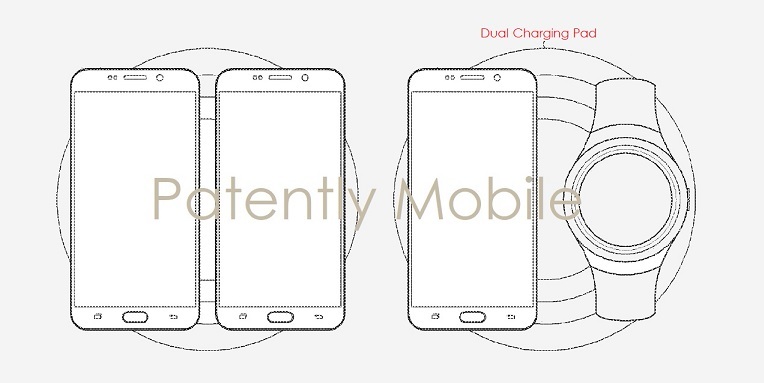 Samsung has filed the patent and had got the approval by the US Patent and Trademark Office (USPTO) for this new Dual Wireless charging pad. Samsung last year introduced EP-PA710 Qi-based Wireless Charger Tray design that can charge 2 devices wirelessly at once. Samsung’s Wireless charging pad is said to take advantage of the both inductive and resonate modes of wireless charging which are Qi compliant. This means that the charging pad can charge any smartphone or wearable product in the market. Going by the initial sketches from the patent, it looks like the dock will have two coils both of them support inductive and resonate charging and the pad can automatically make the switch between the two when it sees fit. According to the patent application, it is designed to charge smartphones or wearable device by using one of the magnetic induction method or the magnetic resonance method and charge the device with either of the methods. Samsung has filed this patent in March, so given the fact that these are just patent files, there isn’t any appropriate timing for their launch. However, it is largely expected that this new Wireless Dual Charging Pad might make an appearance at the Galaxy S9 launch which is slated for early 2018.